After rumors for about three years or so, Konica finally introduced the Hexar RF on October 13, 1999. The new Konica is the first substantially new M mount camera body since the M6 in 1984, discontinued October 2003 and the first M mount camera produced independently of Leica. Imagine starting with a Leica M6, adding AE exposure with AE lock, motorized film advance and rewind, a great finder shutter speed display, and an electronic metal shutter with a wider shutter range: that's the Konica Hexar RF -- more or less. The Hexar RF is an excellent camera. With some features that no Leica M had until the introduction of the Leica M7 in 2002. I expect some Hexar RF's finding themselves into a Leica bag, working besides an M6 to offer the photog the best of both. Another way to look at the Hexar RF is as a grown up Minolta CLE with AE lock, metered manual, a wider shutter speed range, and motorized film advance added -- but with the TTL flash taken away. How good is the Hexar ? Excellent indeed. Feel and fit are up to Leica standards. If it had the better Leica finder, I would have little trouble believing a Leica label on the top plate. Very simple well placed intuitive controls help make this camera a pleasure. The standard top and bottom covers are Titanium- a very nice touch. Did anyone say "Leica Copy"? 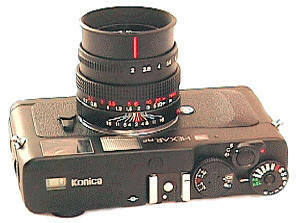 The Konica RF's Rangefinder / Viewfinder is very similar to the Leica M6. Curiously the Hexar has the SAME framelines as the M6: 28, 35. 50, 75, 90, 135. Konica uses the SAME framelines combinations as Leica: 28+90, 50+75, 35+135 which are automatically selected when you mount the lens, and even uses the same type of frame preview lever in the same M location. Wow, what an amazing coincidence that Leica and Konica came up with the same framelines and frameline combinations -- what are the chances of that happening?? More amazing is that the internal design seems to be a obvious copy of the Leica M. This near clone of the M6 finder (at least from the standpoint of bare specifications) is a first. No other camera manufacturer, including Nikon or Canon or Zeiss, ever manufactured a viewfinder as complicated as the Leica M. The obvious question is whether it was done with Leica's help. Despite rumors to the contrary, the answer seems that it was not. It turns out the Konica Hexar RF finder is produced by a prominent Japanese wholesale supplier with little retail recognition, which strangely also produces the finders for the Contax G2 and Fujica/Hassy Xpan. While all of excellent quality, all are definitely a bit darker than the Leica M or Voigtlander Bessa R.
Alas, the Konica's framelines are not quite as bright and easily seen as in the Leica M6 finder -- though they are still quite bright. The Hexar's brightlines can sometimes have bright/dark line patterns in them -- for reason's I don't understand. The Hexar RF rangefinder patch is slightly smaller than the M6, but just as a tad less bright at least to my eyes. It would be interesting to measure and measure each camera's finder and rangefinder brightness, but I do not have that capability. The Hexar RF's viewfinder/RF is not as bright as a Leica M, or a Voigtlander Bessa R. You need to keep your eye centered in the rangefinder exit pupil -- a bit one way or the other and the image will seem to be out of focus when it isn't. The smaller image size of the framelines make it better suited for 50mm lenses and shorter in my opinion. The 90 frameline is OK depending upon the subject, but the 135 frameline is so small you will probably have a hard time framing what you are shooting. 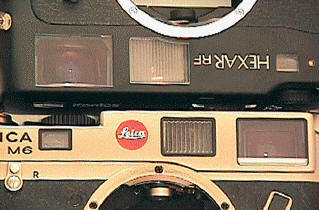 On the other hand, the 28 and 35 framelines are more usable for glasses wearers than any Leica M camera except the .58. The .58 M6 does have a noticeably better finder than the Konica RF, but the Konica RF has features not found on any other M camera. The Hexar's LED finder readouts are easily seen and read --the best shutter speed finder readout I have ever seen in any rangefinder, but some photogs consider the readout as being too bright and distracting. See for yourself if you like it. On AE, red LED shutter speeds are lit in a bright vertical display on the left side of the finder. Though the actual shutter speeds are steplessly set on AE from 1/4000th to 16 seconds, finder display are limited from 1/4000th to 4. On AEL (AE Lock), the shutter speed stays the same as long as you keep slight pressure on the shutter release. On manual, the suggested shutter speed stays lit, while the manually set shutter speeds blinks in Red. Also visible in the finder are exposure compensation warnings and flash ready signal (with a dedicated flash unit). In use, this finder display system is very easy and convenient. AE Exposure Compensation trick: Meter and use AE lock, then adjust the f/stop to compensate as you like, take the shot. It's simple, easy, and fast. Viewing area is 85% at 3 meters, and becomes less as the lens is focused to infinity which increases the lens' angle of view (yeah, weird I know, but optics are like that). The Hexar has the SAME rangefinder baselength: 69.2 mm as the Leica M. Curiously, the Hexar's image magnification is lower at .6 (same as the Leica CL) instead of Leica's .72 or .85, resulting in an effective rangefinder baselength of 69.2 x .6 = 41.5 which is 83% as accurate (all other factors being equal) as the .72 M6. In practical terms this means the Hexar will be easier to use with the 28 and 35 for eye glasses wearers, but won't give the focusing accuracy needed for the 50/1.4 or faster, 75/1.4, 90/2, or 135/4 wide-open at the closest focusing distance. The Hexar RF's controls are superbly laid out, intuitive to use, VERY convenient and fast working. Top left shows the LED frame counter and battery check. The five function shutter speed dial and collar controls the on/off, single advance, continuous advance, self timer, and AE hold when slightly depressed. The shutter speed dial is ideally positioned at the corner of the camera to be movable while the camera is still held to the photog's eye. The manual shutter speeds are 1 to 1/4000th plus B. AE stands for automatic center weighted aperture control. 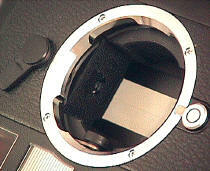 The AEL stands for AE Lock, which provides the important exposure hold on AE. The film speed and exposure compensation are set with the larger dial. The battery check next to the LCD frame counter is ALWAYS visible, even if the camera is off, a nice touch. If you don't see it, you know you have a dead battery. 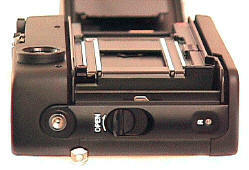 The Konica Hexar RF sports the phenomena of swing open back door film loading - something rare indeed in M mount cameras. Those gold contacts in the film chamber set the automatic DX film speed from the film cartridge, but you do have the option of manually setting the film speed. The film loading and automatic rewinding is much faster than with a Leica M.
The preview frameline lever works just like the one on the M6; I wonder where Konica got that idea. The metering cell in the film chamber reads reflected light off the gray metal shutter curtain. Shown are the Hexar's vertical travel metal shutter and easy automatic film loading. It's fast and easy, worth the price of batteries in my opinion. Too bad the Hexar RF does not have the all but silent "stealth" film advance of the earlier Hexar AF. Although the Hexar RF does not presently have a data back, one apparently has been provided for in the future considering those gold contacts next to the film channel. The early production Hexar I examined had a much louder shutter than I would have liked. The later Hexar I used six months later was much quieter, with a noise level now down to an acceptable level. 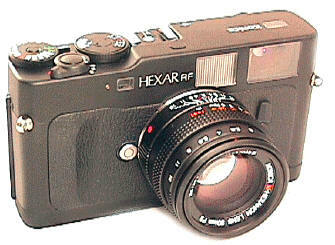 This later Hexar sounds like a quiet motorized SLR, but is still nosier than a Leica M6. Konica M Lenses: Konica initially offered three M mount lenses, the 28/2.8, 50/2, and 90/2.8. All exhibit very high craftsmanship and have a great feel to working them. The focusing ring on all three is heavily ribbed and very convenient. With Konica long standing excellent optical reputation, it's a fairly safe bet all are excellent performers, though probably not equal to the more expensive Leica M lenses. User reports of the Konica lenses have turned out to be impressive. Some people consider the Konica M optical quality comparable to Leica. The 50 and 90 have built in hoods. The 28 is supplied with a separate hood. The lenses are supplied with caps and leather pouch. An ODD thing about these lenses is that if you put them side by side their Leica equivalents, the Konica lenses appear to be the better made with heavier construction! OK, I know it's Leica heresy even to suggest such a possibility, but try putting the new Konica M lenses side by side current lens offerings from Solms, and draw your own conclusions. The 4th Konica M series strangely turned out to be a 50/1.2, sold in the Konica new limited edition millennium kit of 2001 units, to be sold, strangely enough, in year 2001. A new design 35/2 was released in 2001. In March 2002 Konica announced a new 21-35 f/3.4-f/4 dual focal length lens. Unfortunately serious doubts about 100% compatibility of Leica M lenses to Konica Hexar RF bodies must logically extend to the Konica M lenses. IF you buy a Konica M lens, I suggest shooting it wide open at its closest focus distance to see if that particular lens focuses correctly with that particular body. Focusing errors, if they exist, will show up wide open and at the closest focus distance, and can easily be masked at medium and small apertures at medium and far distances. 1st M camera with a conventional around-the-shutter-release shutter lock. The CLE has a much less convenient front mounted on/off switch. 1st M camera NOT made by Leica which takes the Leitz 50/2 Dual Range with close-up attachment. This may not be true with all DR variations, but the particular DR I tried worked fine with the Hexar RF. "Bayonet Konica KM mount" take note Konica makes a point of NOT calling it a Leica M mount. Die cast aluminum body and Titanium top and bottom covers, a nice quality touch. Hexar RF body size very slightly larger than the Leica M6, with squared off corners rather than round, weighing just under 22 oz with batteries. Motorized film advance and rewind: Though the Hexar RF's motor only manages 2.5 fps, it is still faster than most people can get from the manual M6's film advance and film rewind, and it is MUCH superior to the M6's original loud, heavy, and unreliable winder/motors. The new M6 motor introduced at Photokina 2000 is supposed to be much improved, yet the M6 with motor is obviously much larger, heavier, and more expensive than a Hexar RF with built in motor. The Konica adds up to faster operation without the added bulk and weight of a M6 motor or of a Rapidwinder. Even with Leica's new improved motor, the Hexar RF has the best M motordrive as far as I am concerned. Negative: dead batteries = dead camera. Aperture priority exposure with memory lock. This is important because no Leica rangefinder has the convenience of aperture priority exposure operation. The Minolta CLE had AE in 1980, but sadly with no AE memory lock or metered manual operation like the Hexar RF. The memory lock is obtained by pressing down the shutter release. AE metered range is 16 sec - 1/4000 range, with a manually metered range of 1 to 1/4000th. Exposure compensation is plus/minus 2 EV range, in 1/3 steps. The metering range is +1.0EV to 18.0EV(ISO100, with F2.0 lens). Strangely enough, the AE Memory Lock is a really BIG DEAL since the Konica Hexar RF is the ONLY M mount camera (or Leica Screw Mount Camera) EVER made with this this feature to date. Of this group, previously only the Minolta CLE has had AE exposure, but sadly no memory lock. Of course virtually ANY AE SLR today has AE lock, even the lowest priced ones. The sad truth is that the Rangefinder market is considered such a small marketing niche very little development money has been put into the breed over the last three decades to develop new features. Fastest M Film Loading and rewinding by far. Metered manual exposure: this might not seem like much, but if you have a CLE and hated the lack of metering on manual, this IS a big deal. I know of no other interchangeable lens 35mm rangefinder with AE that has metered manual. When you take the camera off AE or AEL, it is on metered manual by default. Activate the metering by slightly depressing the shutter release. The meter suggested shutter speed LED will stay lit, while the metered shutter speed for the selected f/stop will blink. As you turn the f/stop the display will move up or down until you have "centered" on the non blinking shutter speed. Shutter speed readout in finder: Vertical LED readout on left side of finder, indicating shutter speeds ranging from 1/4000th to 1/4. This is a nice feature, but a lot depends upon the display and how well it was done. Some displays are great and stand out in any light, others can be hard to see. Range 1/4 to 1/4000th plus exposure compensation warning. Flash: WHAT A BUMMER!! THE HEXAR DOES NOT HAVE TTL FLASH! Geez, how did this happen??? 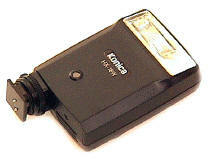 The Konica flash reads off a flash sensor on the flash itself, not through-the-lens! Either the Konica designers really screwed up by using this outdated system on their new camera, or they wanted to leave the TTL flash niche to the M6 TTL. Flash: 1/125th flash sync (the highest flash sync speed of any M mount camera), In AE, flash sync is automatically set at 1/125th (too bad the user can't choose the sync speed on AE). The Hexar RF kit includes the HX-18W flash with very mediocre credentials: guide number of 18 (ASA 100), covers up to 28mm without a wide angle attachment, 2 AA batteries, direct flash only, NO TTL, no bounce or rotational ability, meager choice of only two auto f/stops (f/2.8 or 5.6 at ASA 100)and manual. To me, this little do nothing flash with 1970's technology is a big disappointment. I see it as cheap way to include a flash with the Konica RF kit, even it it's not worth a damn. On the other hand, the Hexar's basic flash is 100% compatible with all the pre-M6 TTL Leica M bodies. It will probably be fine with the M6 TTLs too, but I have not tried it. Battery: two 3 v lithium (CR2), estimated life 100 rolls 36 exposure film. Apparently identical lens mount. After the Leica M patent expired, Konica is the first to bring a new M camera to market. What appear to be VERY similar rangefinder/viewfinders which share the SAME rangefinder baselength and the SAME framelines. This is BIG deal, the first time the Leica M RF/VF has been more or less successfully duplicated by another manufacturer. A Bargain Price. The Hexar RF body is about half the price of a M6 body, about 40% of the price of a M6 with the new M motor added. Faster overall operation due to Aperture priority, built in film advance, automatic film loading and rewinding. Internal Motor drive of up to 2.5 fps, the best M camera motor. With the Konica's motorized film advance, a photog can walk around with the camera at their side not obviously taking a series of pictures. This trick is a lot more difficult if not almost impossible if you have to manually advance the film. Noticeably Better Finder in terms of brightness and clarity. More accurate focusing. The .72 and .85 M6 offer longer effective rangefinder bases, so greater accuracy. The .58 M6 has a finder with essentially the same effective rangefinder baselength as the Hexar RF. Since the .72 M6 is pushed to its limits to focus a 50/1, 75/1.4, or 90/2, it's a safe bet these high speed lenses will be questionably accurate on the Hexar RF. Even the 50/1.4 will be questionable on the Hexar. Much more extensive Leica lens lineup, but of course lenses will interchange between the Hexar and M6. The Hexar has no standard PC flash connection, though of course you can use the studio flash through an adapter on the hot shoe. The Why Can't Leica Do It ? Department: If Konica can put together beautiful packaging like this on the standard Hexar RF, why can't Leica do it on the higher priced standard Leica M6 ? I don't mean the kit, I mean the higher level of quality packaging. To me the Hexar RF is most interesting for what it is not: a clear knockout of the M6. Konica could have made a far more sophisticated camera which just buried the M6. Instead, Konica selected improvements which make for a not so clear choice that allows the M6 to compete in the marketplace. Why? Part of the answer seems to be that the RF was not originally a Konica design, but came from another Japanese company. TTL Flash: I can hardly believe Konica missed this one. The Minolta CLE still looks good. Silent mode film advance as on the original Hexar. The Hexar RF's motorized advance might be considered comparable to a quiet motorized SLR, but it is not nearly so quiet as a Leica M. This will likely prove a big issue for many experienced M users. The original Hexar's silent mode was apparently a patent violation, and so was withdrawn. Too bad they still haven't worked out an agreement. Spot metering. If Konica could build a 3 degree spot meter in the Hexar, why not the Hexar RF? A large lens lineup. Konica is offering only a 28/2.8, 50/2 and 90/2.8 to begin with. It is almost as Konica is keeping its M lineup small so as not to dig too deeply into Leica M lens sales. Remember Konica is a very rich company from its non-photographic operations. Had Konica wanted to, it has the capacity to introduce a wider range of lenses than Leica now has for the M. On the other hand, will Konica really sell a lot of M lenses unless they are bargain priced like Cosina / Voigtlander ? I doubt it -- most photogs will choose Leica glass if the price is close. Hmm... I wonder why Konica would design a modernized, but NOT leading design? Do their designers lack the vision, the budget, or do they want to position the Hexar below a yet to be announced Leica ?? Once upon a time if you visit the Konica's own Hexar RF website (now long gone) the Q/A section would tell you that the "RF" stands for "Rangefinder" and "Focal" plane shutter. Right, sure it does. LOL. It's more likely the Design Department knew what RF stands for (RangeFinder), but did not bother to tell the Know-it-Alls in Advertising. I'm looking forward to find out what these photographic pundits claim "35mm" stands for. How Close Can a Leica copy be, and not be a Leica? The Hexar RF's finder and lens mount bring a new meaning to the old term of "Leica Copy." 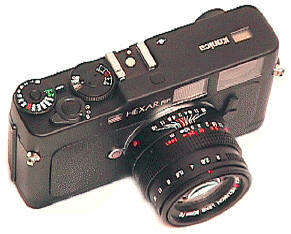 I was astounded that the Hexar RF's viewfinder / rangefinder seems to be a near copy of the Leica M6. Several years ago I spoke with a respected Japanese camera industry consultant. He informed me the problem with a Japanese made M competitor was the viewfinder -- that Japanese industry simply lacked the ability to produce such a complicated optical viewfinder as the M6. Two years later, Konica seems to have found a way. Konica is getting surprisingly bold in copying Leica technology. I'm told Konica buys the Hexar RF finder from a subcontractor who also make the finders for the Contax G2 and Fujica/Hassy Xpan. 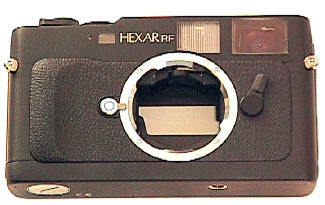 Do the limitations of the Hexar RF leave room for another Hexar RF with more features --- perhaps the Leica M7? The most obvious change would be adding a Leica made finder with .72 and .85 magnification to match the preferences of the European and American markets, and a silent advance mode like the original Hexar of a few years ago. The knockout touches would be upping the motor to at least 4 fps, wireless remote TTL flash capability, flash sync at 1/250th, and a sophisticated data back capable of imprinting whatever the photog chooses. An M7 like that would be worthy of the name. Probably not of course, but there is no law against dreaming. Was there a Leica / Konica connection at one time ?? Leica's CEO Mr. Cohn was definite at the 1999 Leica Historical Society meeting that there was not. How is the Hexar RF working out so far ? Body price is about half of a M6 .58, making the Hexar RF a bargain price wise. Rumored monthly production is only 500 cameras. If this is true, expect a long line for awhile. The camera tested is # 1440824. I wonder if the starting serial # is 1440001. Many early Hexar RF's reportedly have a problem with the rangefinder mechanism focusing PAST infinity when the lens is focused ON infinity, but of course Konica will quickly correct the problem. Another problem for Konica is that far more bodies than lenses are being sold in the Japanese market, creating an excess stock of genuine "Konica KM" glass on the dealer's shelves. In the US, Konica seems to be putting about as much marketing into the RF as the previous Hexar, which is to say none. Eventually this will turn into a relatively low production camera if Konica does not increase the ad budget. July 2000 Update: The Hexar has been out long enough to put it more into more perspective. Despite the Hexar RF being a very well made camera with some unique M mount features, it seems to have gained modest but not overwhelming popularity amongst M users. While some features are very nice and some are even unique in M mount, it's still a camera which dies without batteries -- a concept very alien to almost a half a century of Leica M users. I've heard stories that Konica does not claim 100% compatibility with Leica M lenses, and that some Konica repair personnel are not overly concerned if Leica M lenses are not accurately focusing on the Hexar RF. If you are a Leica M owner considering the Konica Hexar RF, perhaps contacting Konica and gathering more information would be a good idea. IF you want Aperture AE with AE lock, a 1/4000th top speed, the best motordrive on any M mount camera, and the fastest film loading and rewinding, your only choice is the Hexar RF. IF you want the best finder, your choice is the M6. Of course the comparisons gets more complicated as you go down every last detail, but for most Leica Photogs it's NOT an Either Or World, otherwise they could not afford Leicas. Until a better combination comes along, I think the best solution is having BOTH the M6 and Konica RF, using both to their respective advantages as the shooting situation calls for it. After years of M loading, the easy effortless film loading is a refreshing change and a big time saver during shooting. Just guessing, I can probably load the RF 3 to 4 times in the time it takes me to load a M.
The automatic film rewinding is another shooting time saver -- things like this can add up to not missing that one great shot you are hoping to get -- instead of watching it go by as you are loading or unloading the camera. Unlike any of the M's, you can instantly tell if the camera is loaded by the film window on the backdoor. You can easily tell if the camera is turned on from the top deck, not only by the red dot visible on the switch, but also by the film counter -- which is visible only when the camera is on. Batteries are always a concern: the battery check is ALWAYS visible on the left top deck. The controls and quick and intuitive, a real pleasure to use. The only thing I don't like is the smaller viewfinder image size with the .6 magnification finder. I like the Leica .72 finder a LOT more. In fact, I also like the Voigtlander Bessa R/R2 finders more. The Hexar RF has a nice finder, but it is not a contender for top honors. IF this camera had the .72 Leica finder, along with centerweighted and matrix ambient and flash metering, it would have been a camera worthy of the M7 designation in my opinion. Photokina September 2000: Not a company to be left out in the cold with all the new limited edition millennium coming out, Konica announced the Konica Hexar RF Limited. 2001 units will be made for the year 2001, a Hexar RF with chrome colored titanium covers and a new 50/1.2 Hexar M lens. Apparently the 50/1.2 is only being sold with the 2001 Limited Edition body -- a rather strange marketing decision it seems to me. Each camera and lens will have matching numbers from 1 to 2001. Expected delivery late March 2001, Japanese list price about $3500 for camera and lens, offered for sale world wide. A new design 35/2 should arrive in 2001. Some Hexar RF users report focusing problems with Leica M lenses, others do not. How could that happen? The EXACT cause of this is a hot source of controversy on the net. Konica is not helping the situation. So far, I have received different answers from every Konica employee I have discussed the issue with. 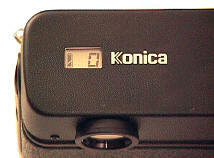 Konica USA offered to adjust the rangefinder of my camera, but admitted this would not be a complete solution. I am told Konica UK actually offers to correct Hexar RF bodies to Leica M specs, for a fee. Konica USA seems to give me a different answer every time I talk with them. Some people swear nothing is wrong with the Hexar RF with Leica M lenses, because THEIR camera has had no problems. Others report focusing problems. Personally MY Hexar RF did NOT have correct back focus specs for Leica M lenses -- I had it repaired. I believe the KEY to the controversy is the INCONSISTENCY -- some people have back focus problems, others swear THEY do not. How could that happen? As suggested to me by a Konica insider, the answer may be the plus/minus tolerances used by Konica. In this scenario, depending upon how a particular camera body's set of parts tolerances add up, that particular camera MAY or MAY NOT exit the factory with back focus specs within Leica lens tolerances. I am not sure this is the solution, but I know of no other explanation which satisfactorily explains the inconsistent results reported by Konica Hexar RF shooters. Hexar RF problems came into the public eye because SOME, not all, Hexar RF owners definitely were not getting sharp shots with the same lens on their RF, as they were from Leica bodies. If there was no problem with the RF, what was the cause of these focusing problems? If there is no problem, why does Konica UK offer a repair service to adjust Hexar bodies to focus Leica M lenses? If there is no problem, how did the Konica factory correct it on MY Hexar RF? If there is no problem, why hasn't Konica publicly said the Hexar RF is fully 100% compatible with Leica M lenses? This controversy is obviously hurting Hexar RF sales. It would be to Konica's advantage to deny it and put the question to rest, IF there was no problem. Instead, Konica has publicly side stepped the issue, saying that the Hexar RF is compatible with the Konica "KM" mount. I interpret Konica's stance as another way of saying "We are not promising Leica M compatibility, because we don't want to pay for a camera recall." Do you see any of the sites claiming there is no problem, offering to buy back or repair Hexar RF's bought on THEIR recommendation which turn out NOT to correctly focus Leica M lenses? If you own a Hexar RF, or plan to buy one, I suggest taking it to a Leica repairman, and have them check the film plane and focusing accuracy, just to be sure -- ideally with both Konica and Leica mount lenses. Quick and Dirty Hexar Back Focus RF test: With your RF mounted on a tripod, focus on INFINITY wide open with your WIDEST lenses. The Voigtlander 12 and 15 are especially useful to spot if your Hexar RF is not up to standard Leica M mount back focus specs. As a control point, shoot the same shots with a Leica M body you know to be in good shooting condition. Compare with a loupe. IF the results are identical, wonderful. IF you get different results with the same lens on different bodies, consider having the back focus of your Hexar RF checked by a repair tech. My thanks to Yoshi, Christian Becker, Gerd Hechtfischer, Bill Erfurth, David Bindle, and Harry Soletsky for providing information and translations. Thanks to Silvio's Photo Works for the loan of this early production camera. 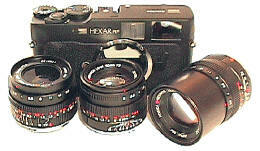 The Konica Hexar RF is an excellent camera with excellent lenses. It remains the best motorized 35mm Leica M film choice to avoid Leica's dreadful and expensive M motors. Unfortunately top Konica management saw it as a prestige "flagship" item for Japan's oldest camera maker, instead of a camera system which could be successfully marketed for a profit. As a result there was zero marketing effort in the US, and surprise of surprise, not enough sales. Who could have seen that coming? The camera was discontinued without official notice that I am aware of by the end of 2003. In early 2005 the Konica camera division disappeared in a merger with Minolta. In early 2006 Konica-Minolta was eaten up by Sony. So where does this leave the proud Konica Hexar RF owner wanting factory authorized service? As near as I can find out, pretty much SOL. There are however still a few independent repair techs who are willing to tackle the intricacies of this virtually impossible to repair if it needs electronic parts camera. 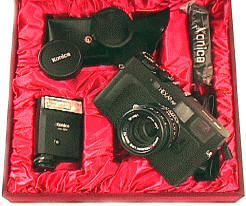 A half frame Konica Hexar RF was produced in very small numbers and never officially exported. A limited edition titanium Konica Hexar RF set was produced with a titanium 50/1.2 Hexar. According to two completely independent sources, Konica had working Hexar RF Digital prototypes behind the scenes when the ill fated Epson RD1 digital was introduced in Las Vegas at the 2004 PMA show. One version had an APS size sensor, the other full frame. I have no other info. Oh well. Digital will never catch on anyway. Revised: September 10, 2017 . Copyright � 1998-2010 Stephen Gandy. All rights reserved. This means you may NOT copy and re-use the text or the pictures in ANY other internet or printed publication of ANY kind. Information in this document is subject to change without notice. Other products and companies referred to herein are trademarks or registered trademarks of their respective companies or mark holders.